The Draft South Shore Blueway Plan establishes a water trail along Nassau County’s south shore and is the result of a community-wide trail planning process that identified access points and gaps where further water access is needed to complete the trail. The public is invited to share their comments both online and during a community discussion November 14, 6:00 pm at Freeport Village Hall Conference Room, located at 46 N. Ocean Avenue, Freeport, New York 11520. Paddlers are invited to help shape the future South Shore Blueway Trail by commenting on the Draft Plan. Designed by Going Coastal, Inc. and Cameron Engineering & Associates, LLP to be a blueprint to cover the development, implementation, maintenance and use of the South Shore Blueway Trail, the plan is a collaborative effort of New York State, Nassau County, Village of Freeport, Town of Hempstead and the Town of Oyster Bay. 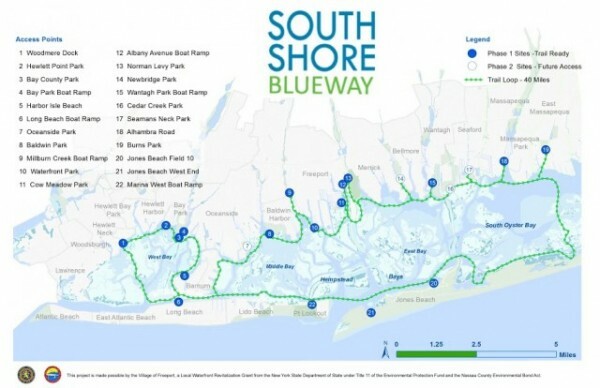 A key element of the new South Shore Blueway Trail Plan is sustainable, American Disability Act compliant access. The plan also proposes developing a branding strategy and provides for interpretive and educational opportunities that will encourage understanding of the south shore ecosystem and maritime heritage.